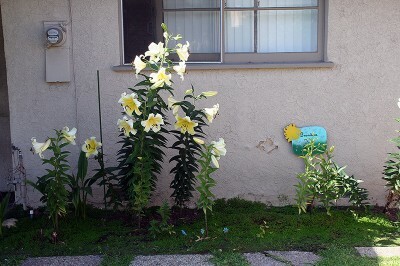 I have some beautiful yellow Conca d’ Oro lilies that grow under our bedroom window. These lily bulbs were a gift from Amara’s Mommy 4 or 5 years ago and I just love them. This year they are not quite as pretty as they were last year but that is my own fault. I waited until spring to divide the bulbs and I should have done it in the fall but they are still wonderful and next year will be their best year yet. Amara had gone out and looked at them with her Mommy and me the night before when Mommy and Daddy dropped her off. Jenna loves seeing them, too. But even so, the first thing Amara and I did on Saturday morning was go out and look at them again. Morning is the best time. It is always so breathtaking to see each new one that is opening up and I think Amara enjoys seeing this as much as I do so. 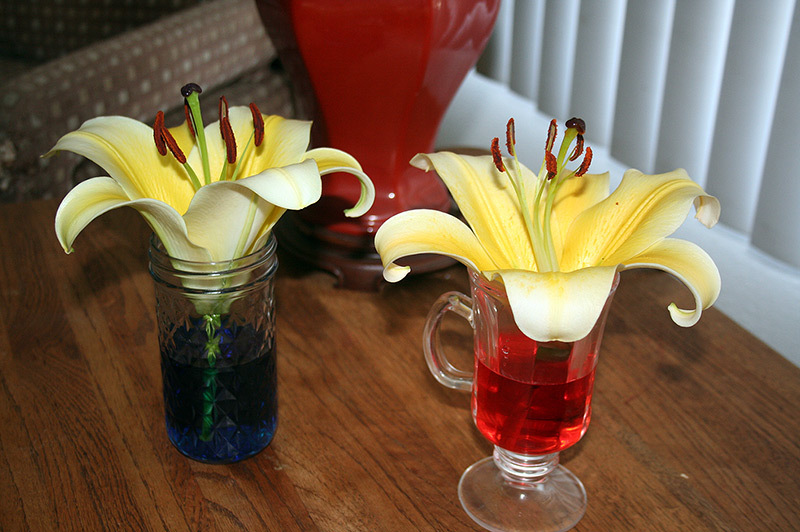 And she says to me “Grandma, we could do an experiment and put food color in the water and the lily will change colors.” It wasn’t really a question so I didn’t answer her because I wasn’t sure I knew where my food coloring was or that it was fresh enough to use. I found it and it was so I grabbed the scissors and Amara and told her — Pick 2! She picked the 2 colors to use — red and blue and added it to the water. And we waited. And we waited. She thought it would take a couple of hours. I had no clue I was just having fun. 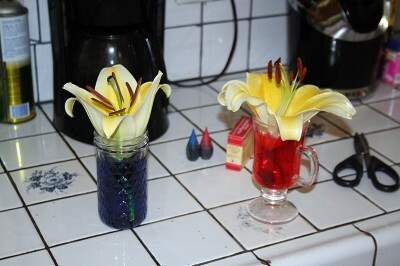 Well, its days later and while the lilies have opened up and it does smell fabulous in here — they didn’t change colors! 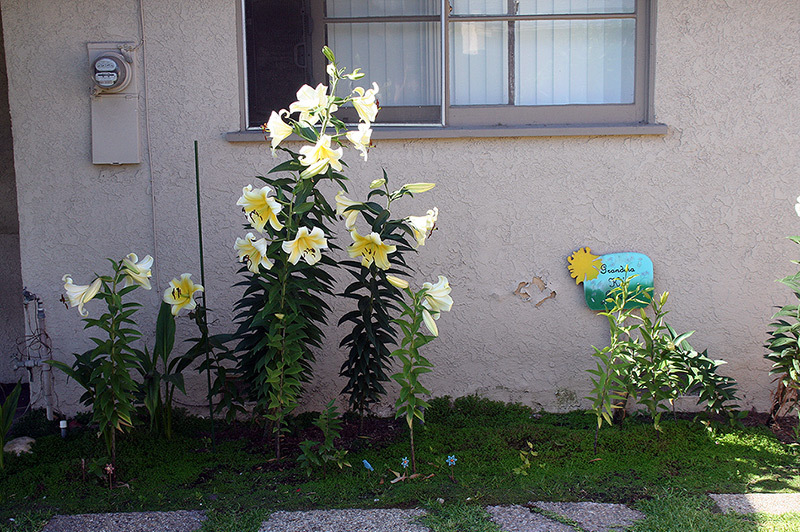 This memory was posted in Backyard Fun and tagged backyard, Conca d'Oro Lilies, science experiment on July 6, 2011 by Grandma Kc. Have her try the same experiment with white carnations. They last long enough that you will see the color change in the blooms. That kind of science is so much fun! I remember doing the same thing with white carnations, as Grams suggested, in high school. I remember doing it with Queen Anne’s Lace wildflowers when I was little. They will turn the color of the food coloring. What fun you two had with your experiment anyway!! The lilies are beautiful!! I divided mine in the spring also and they aren’t as good as I’d hope for either. Next year we will both have better luck! I have discussed it with Amara and our very next experiment is going to be the carnations! I will keep all of you updated. My only complaint about the carnations is they won’t smell nearly as good! You come up with such a good combination of learning and fun experiments. We have tried that experiment before with carnations. Only partial success. Good try, though. I remember doing this with celery and it did work! I think Amara learned this in science class. I’m not sure why it wouldn’t work with lilies since the idea is that plants absorb water and nutrients to grow. See…now I’m a botanist too! Sorry it didn’t work. Try white carnations they do work. I like using the spray variety rather than the single ones, get a better effect. I love that Amara suggested this! So, not all experiments work. That’s not a bad lesson to learn. It seems to me it works with white daisies. So, the experiment is now, which white flowers absorb food coloring through their stems?